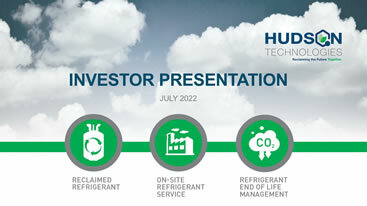 Hudson Technologies is committed to employing its engineering and chemistry know-how to provide our customers with economic solutions that also provide significant environmental benefits to all. 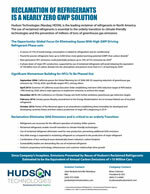 Our solutions include, but are not limited to: capturing and recycling refrigerants and other ozone depleting and global warming gases; optimizing energy systems to reduce energy consumption and increase operating efficiency thereby lowering their overall carbon footprint; development and support of best practices to enable equipment operators to lower their footprint on the environment. Our mission is global in scope and our solutions are designed to serve the US as well as other developed nations and developing economies throughout the world. For best PDF viewing experience please use the latest Acrobat Reader.